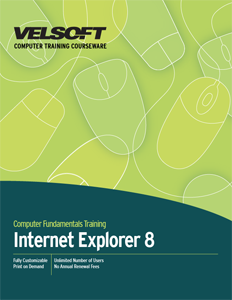 This training courseware title provides everything you need to professionally deliver Internet Explorer 8 training including editable training manual, hands-on exercises, exercise files, detailed instructor guide, classroom-ready PowerPoint slides, and unlimited online learning licensing. Seeing is Believing This sample manual to teach Internet Explorer 8 is in MS Word format. Browsers by nature are a simple program; they're designed for one purpose and that is to display information to the end user - you. Over time they've become that and so much more and with the new features and capabilities come new things to learn. Windows Internet Explorer 8 (IE8) has many new features and is Microsoft's latest web browser and comes as the default browser for Microsoft Windows 7. It has all the latest features that a web user would want, and Trainingmaterial.com's courseware will show you how to get the most out of the learning experience! Download your free sample courseware and see for yourself how easy it is to use our courseware!